Ever since the time that Islam rose to spread its light across the middle East, North Africa, Spain and parts of Europe, the Christian church and the European rules have felt threatened, religiously and politically. Both the Christian missionaries and orientialist began studying Islam in order to spread lies and slander its teachings, and to let the people developa hatred and fear of Islam. They have even invented name-calling to slander the religion of Islam and Prophet Muhammad (saw). 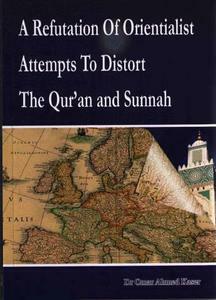 Accordingly, any open-minded person embarking on a study of Islam and its histoy, especially if reading books written in European languages, should be aware of the apparently inherent misconceptions and distortions that permeate almost all non-Muslim writings on Islam. In the last year of the Twentieth Century, it does not seem that much has changed, even though most Muslims would agree that material progress is being made.